Henry Stephen OBE, MBE was born in Manchester on 10 July 1889, the son of John H. Stephen and Mary E. Owen. At the time of the 1911 census, Henry Stephen (21) was a student, living at 98 Bland Street, Manchester with his father John (48) who was a printer compositor, his mother Mary Eliza (46), and his sister Florence (10). Stephen worked with Chaim Weizmann at the University of Manchester, and was then Professor of Chemistry and Dean of the Faculty of Science at Witwatersrand University in South Africa. He invented the Stephen reaction, a way to make aldehydes (R-CHO) from nitriles (R-CN). Henry Stephen was married twice, first to Edith Heyworth, by whom he had one son, James (born 1924). After her death in 1929 he married Theodora de Keiwet (known as Dora), by whom he had three children, Michael, Edith, and Richard. He retired from Witwatersrand University in 1954. and returned to England in 1957. Henry Stephen was the first editor of the chemistry journal Tetrahedron. The Stephens lived in Cumnor Rise, and it is only after the death of Henry Stephen on 6 July 1965 that the Headington connection came about. His widow Dora sold their Cumnor house and bought the land off Kiln Lane in Risinghurst (including the lake) that had been attached to C.S. Lewis’s house, The Kilns. She had a new house built for herself on part of this land (8 Lewis Close, next door to the Kilns). The present nature reserve was then full of brambles, and the lake clogged with weeds, and in 1969 Dora Stephen gave this 12 acres of land to BBONT (the Berks, Bucks, and Oxon Naturalists’ Trust), which has since been renamed BBOWT (the Berks, Bucks, and Oxon Wildlife Trust). She wanted it named the the Henry Stephen Nature Reserve in memory of her husband, but eventually a compromise was reached and it was called the Henry Stephen/C.S. 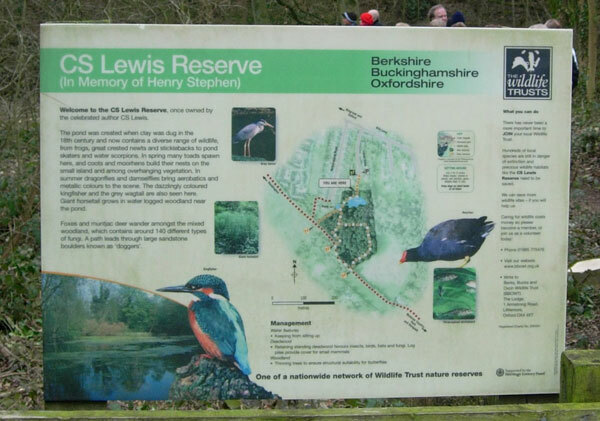 Lewis Nature Reserve. In 2003 the reserve was renamed the C.S. Lewis Reserve (In Memory of Henry Stephen). Dora Stephen, who was also an eminent chemist, continued to edit the journal Tetrahedron until she retired at the age of 85. She sold her house on Lewis Close in about 2000 and died in 2006.